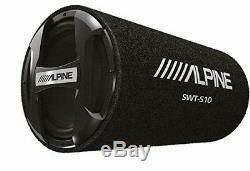 Alpine SWT-S10, Single 10 Loaded Subwoofer Bass Tube - 1200W Peak Power. Alpine SWT-S10 Single 10 Bass Tube Subwoofer - 1200 Watts. Preloaded with a single 10 Subwoofer. Sealed enclosure with black carpet. Enclosure Dimensions: 11.22"W x 23.6" D. Passive Design (Non Amplified) Push SPK Terminal. Black Carpet Finish with White Alpine Logo. From with-in the United States please call. We are however unable to guarantee the cancelation. At AVLeaderz we work hard to make the return process simple and fast. Prices, specifications, and images are subject to change without notice. The item "Alpine SWT-S10, Single 10 Loaded Subwoofer Bass Tube 1200W Peak Power" is in sale since Monday, January 28, 2019. This item is in the category "Consumer Electronics\Vehicle Electronics & GPS\Car Audio\Car Subwoofers". The seller is "avleaderz_com" and is located in Sacramento, California. This item can be shipped to United States, Canada, Australia, Japan, South Korea, Indonesia, Taiwan, South africa, Thailand, Hong Kong, Bahamas, Israel, Mexico, New Zealand, Philippines, Singapore, Saudi arabia, United arab emirates, Qatar, Kuwait, Bahrain, Malaysia, Brazil, Chile, Colombia, Costa rica, Dominican republic, Panama, Trinidad and tobago, Guatemala, El salvador, Honduras, Jamaica, Viet nam.